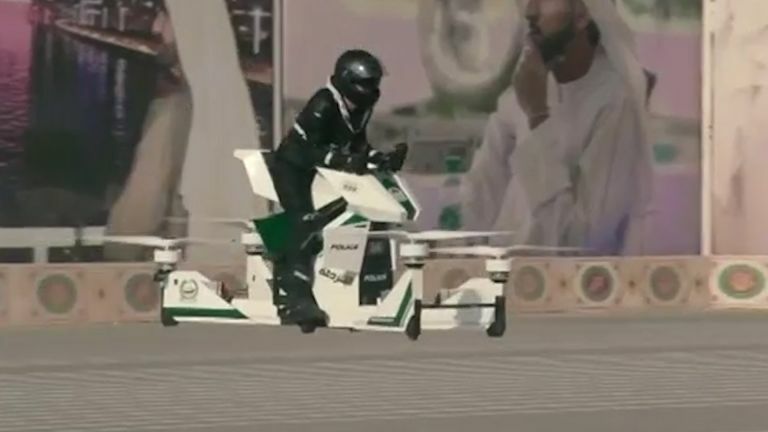 Hoverbikes that can actually fly thanks to quadcopters are now owned by the Dubai police force. The enforcement agency has shown off their new futuristic Hoversurf Scorpion tool for crime fighting in a video. The hoverbikes, which clearly require some trained skills to ride, can hit an impressive 43mph, up to 10 metres in height and keep going for a full half hour. That includes carrying a weighty 270kg of load - so more than enough for an armed officer then. This was based on the battery powered Scorpion-3 model and adapted for the police. The Russian Hoversurf company which created this wonder machine must be pleased they don’t have to worry about people being arrested for flying this. Those dangerous rotors are now the responsibility of the police pilot - good luck anyone trying to escape on foot. This isn’t the first futuristic move by the Dubai police force. The hoverbike will join the force’s robot police officer and the city’s hyper advanced EHang drone which has the capacity to carry 184 passengers and should soon start making regular flights over the city. The price of this machine hasn’t been shared but it’s likely not far off a hypercar, despite not being able to keep up with the many hypercars in the city. Like we said, dirtbags on foot, watch out. Everyone rich enough to escape in a hypercar, carry on. After a cheap drone for Christmas? Parrot's drone deals will fly off the shelves!